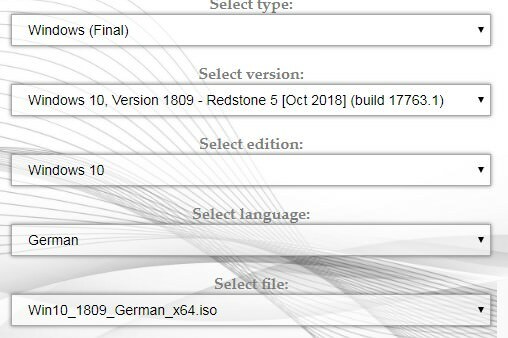 [German]Microsoft has been rolling out the October 2018 update (version 1809) of Windows 10 worldwide since Tuesday, October 2, 2018. As expected, it was launched a few hours ago at the press event held in New York on October 2, 2018. The major rollout begins at patchday (October 9, 2018). The feature update is available as Build 17763.1 for Windows Insider in the Release Preview Ring. This way you can install the update directly. If you start a search under Windows Update and has a compatible machine, the feature update should also be offered (see this article from Microsoft). Users can download the Media Creation Tool (MCT) from this Microsoft site. I just tested it, it downloads the file MediaCreationTool1809.exe. Then logon to a administrator account, launch Media Creation Tool an download the Windows 10 V1809 installation image from Microsoft, and save it as an ISO file or on a USB stick. Then you can boot the machine from the install media and force a clean install. Or use a running Windows 10 build to launch setup.exe from the install media. This will force an upgrade install to V1809. Furthermore, the ISO installation file for Windows 10 V1809 Enterprise is available for enterprise customers in Volume Licensing Service Center (VLSC). MSDN subscribers can download the installation images from the MSDN portal. If you want to pull an ISO installation medium without using the Media Creation Tool, but don’t have access to the VLSC or an MSDN subscription, you can visit the Adguard website. Just select in the form as type “Windows (Final)” and then the version 1809, the language and the 32- or 64-bit variant. The download link will then be offered in a browser window. The website Adguard mentioned here only provides links pointing to the official Microsoft servers. The download is not from obscure sources, it’s from Microsoft. Windows 10 Version 1809 introduces a number of minor improvements compared to older builds. The clipboard has been improved and is able to store more information (e.g. text and images). With a Microsoft account the content can be shared between several devices from this version on. Storage Sense can automatically release storage on the system. I reported about this feature in the blog post Windows 10: Disk Cleanup is declared as deprecated. Minor improvements have been made in the Microsoft Edge browser, there is a dark mode (dark theme) for Windows or certain applications. In the Task Manager you can display the power consumption of tasks. Furthermore the app ‘Your Smartphone’ allows to exchange data with a smartphone (Android, iOS). A more detailed description of the new features can be found within this Microsoft article, or here. Bleeping Computer has also a nice overview. But there are also functions that are obsolete or not available with Windows 10 V1809 or higher. I had an overview in the blog post Windows 10 V1809: Removed and deprecated features. This entry was posted in Windows and tagged Windows 10 V1803. Bookmark the permalink. Officially it’s just re-released to fast and slow ring for Insider – an it’s in the Release Preview Ring.